The language faculty consists of various buildings strung along the water (Witte Singel). In the common facilities block lecture rooms and amenities are ranged along a tall elongated central corridor. The renovated Arsenaal building comprises two linked squares each with an inner court. One inner court has been built in, the other covered with a transparent dome supported by an agglutinated timber structure rising from a single point. 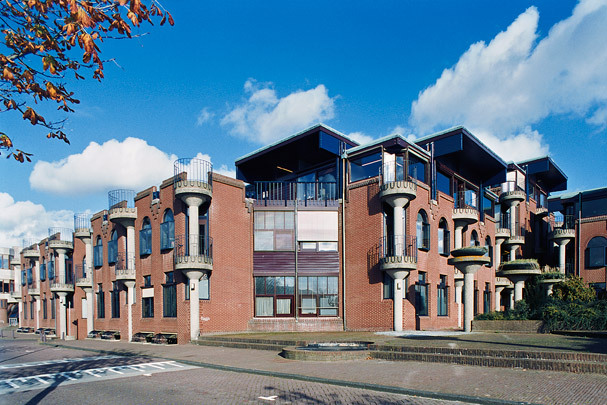 Van Kasteel's library and the two faculty buildings by Van Stigt flanking it share the same principles of structure and measurement: round columns whose conical capitals support concrete floor slabs.